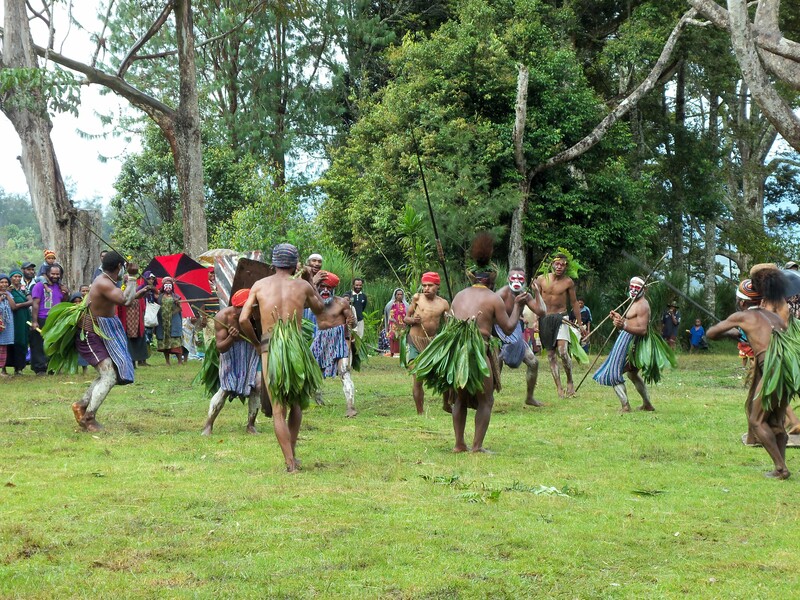 When the performers are finally ready we are all invited back to the viewing area and the tribes then circle the parade ground. As they approach the viewing area, or earlier as the mood takes them, they start in to their dances. It is impossible to describe the Sing Sing, so I will just let our home made movie do the talking. 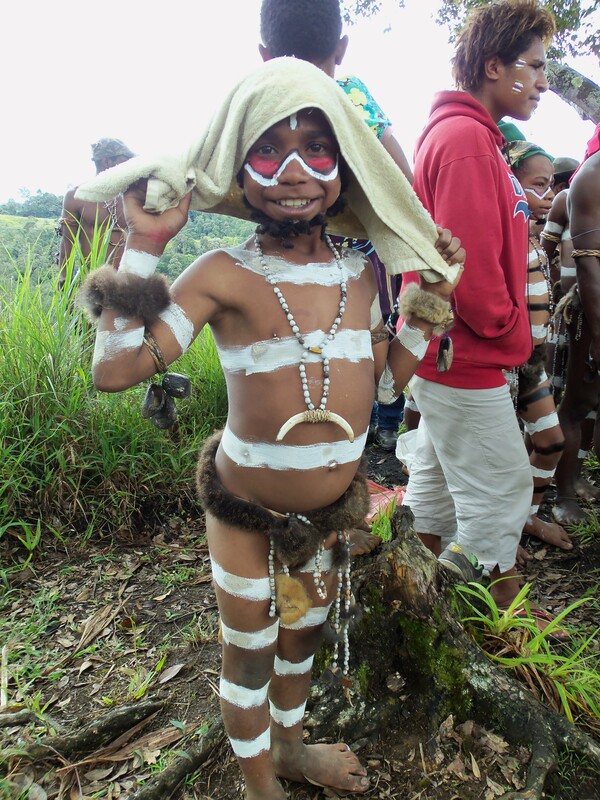 After the dancing we are introduced to each tribe and they explain the meaning behind their dance and their costume. The most fascinating are the Mud Men. 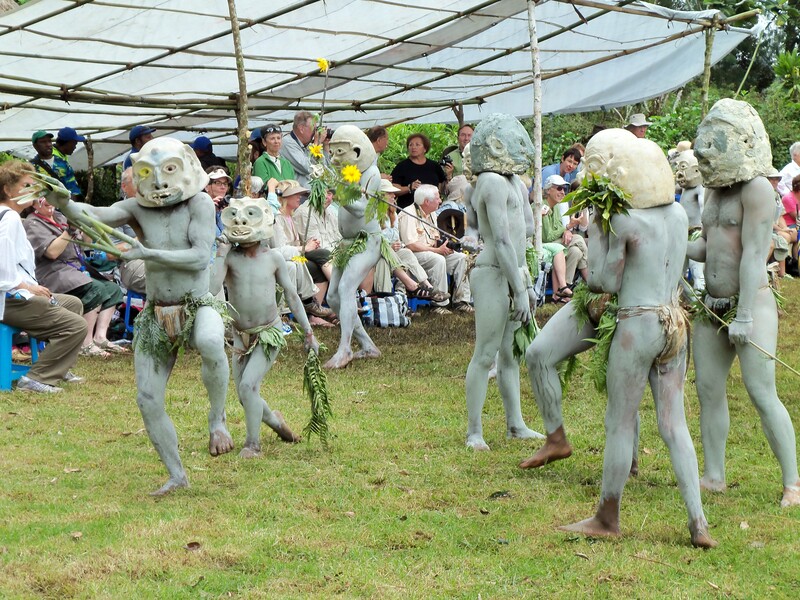 This is the enactment of a myth of the Asaro tribe. Long ago there was a land dispute between a small clan and a much larger clan, which ended in the larger clan running the smaller clan off their land. The smaller clan knew they could never get their land back by fighting, so they devised a clever plan. They designed ugly looking masks of grey clay which they put over their heads. 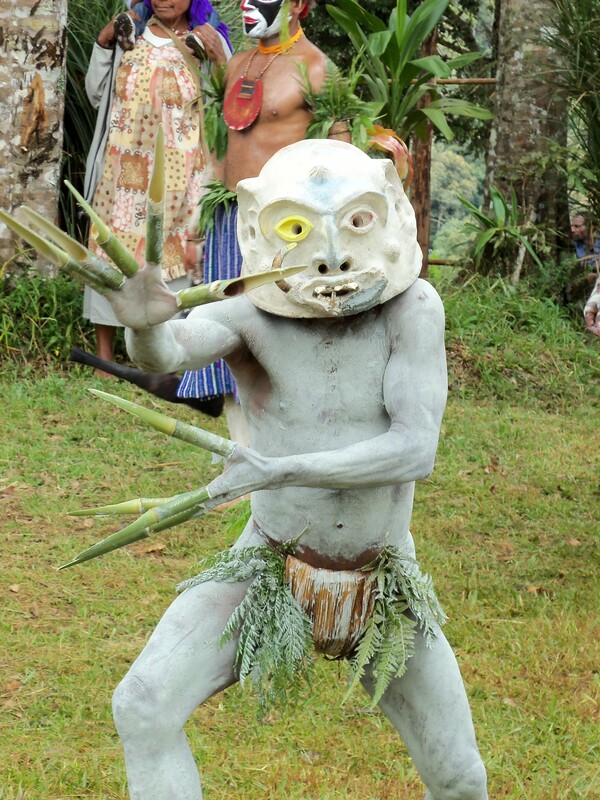 They then smeared their bodies with the same grey clay and attached long bamboos to their fingers in order to appear to their enemies as ghosts or spirits of the dead from their clan. During the night they crept over to the village and slowly emerged from the graveyard in the early morning mist. The women of the larger clan saw them and ran screaming in terror, yelling that the spirits were coming. The clan was so frightened that they ran from the village, never to return. The smaller clan won their village back. It makes for a good story and a chance for the modern tribesmen to have a lot of fun with it. The Jimi Clan are from a very remote mountain. Historically they were very short, like pygmies or dwarfs. But as their food supply increased so did their height. A little intermarriage with regular sized tribes didn’t hurt either. Their dance simply tells the story of their change over the generations and the original short tribesmen are now portrayed by children wearing beards! 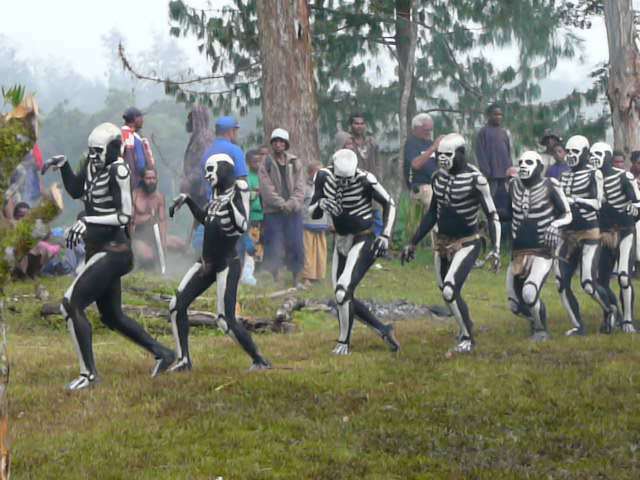 The skeleton dance is another re-enactment of a myth. A mother and small boy went to their garden. While the mother was busy gardening the small boy noticed a group of strange men coming out of a cave. They were painted half black and half white and had very long fingernails. They walked in bent positions and formed a long snake line. The dancers are torn between saving their beautiful headresses or continuing on with the Sing Sing. Some gather beneath a tree hoping for the rain to stop. But it doesn’t. Their makeup begins to wash away. In the end it doesn’t matter. They have done their dances and now it’s time to party. 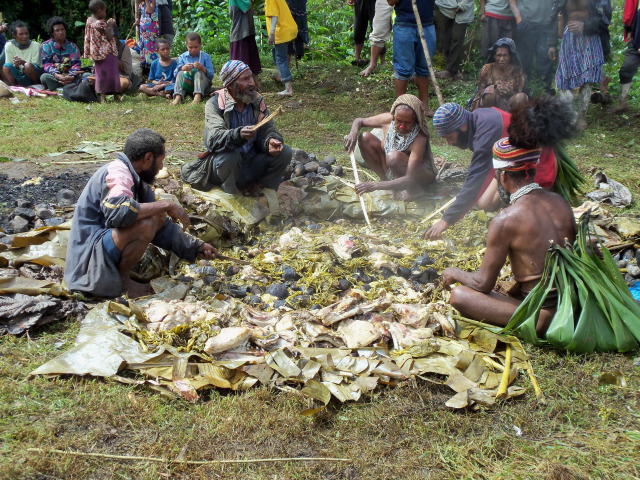 We are invited to watch for a while, but the Mumu is ready, and as the food gets dug out of the pit. 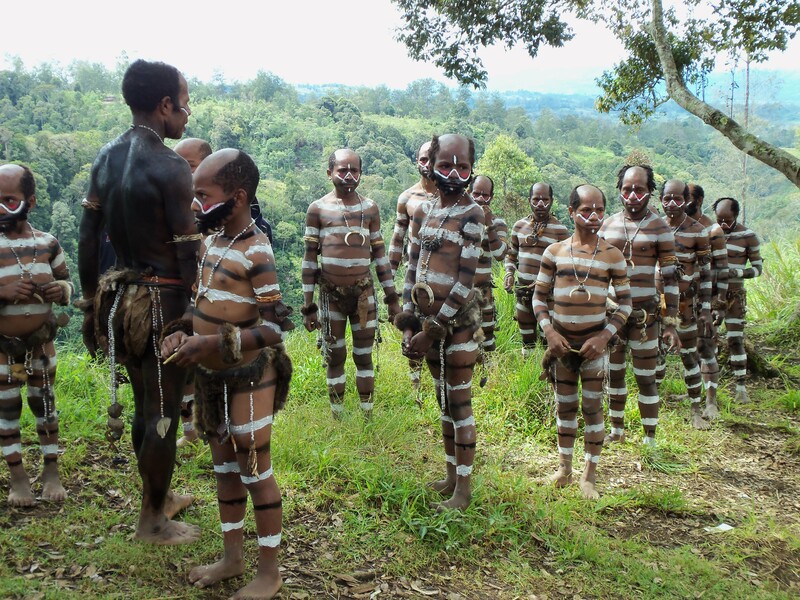 It’s time for the tourists to leave and for the tribes to have their fun. The septuagenarians have already made their way back to the bus as they are anxious to get back to their cozy hotel, but the fearless five are reluctant to leave. However after the incredible day the tribes have given us there is no way we are going to overstay our welcome. 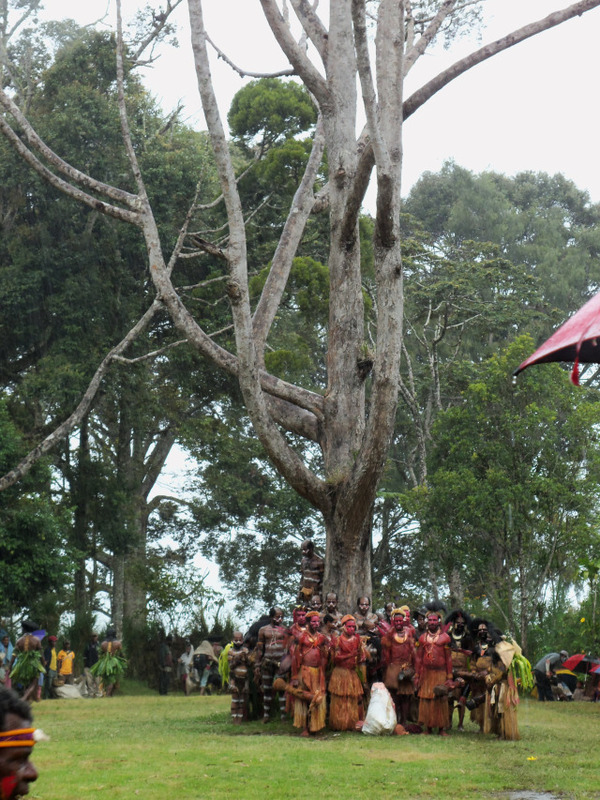 As we trudge back to our bus in the pouring rain, we leave behind the sound of drums, dancing, excited voices and laughter. It is going to be one hell of a party. But the party has come to an end for the fearless five. Twelve days of incredible adventure shared with new friends have come to end. Tomorrow we fly back to Port Moresby, then Australia and then on to Bali. 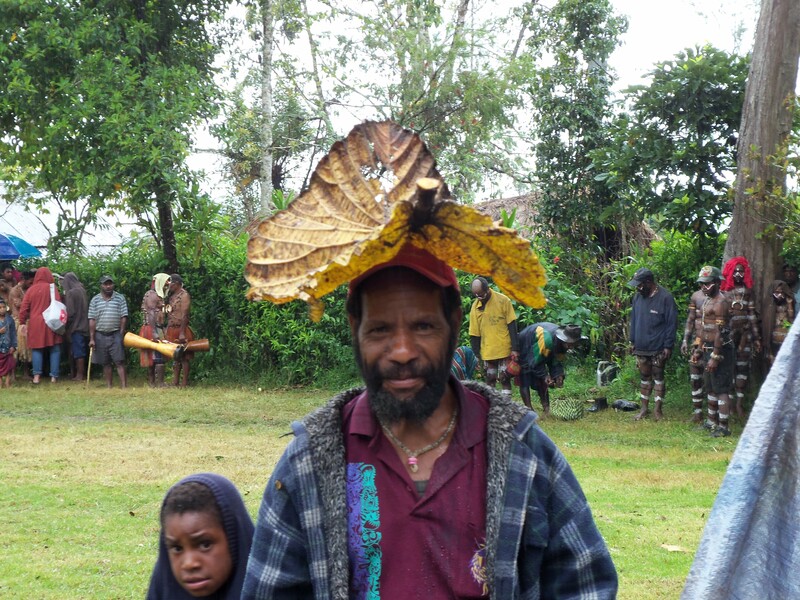 I don’t want to leave PNG, but it is time. We are all exhausted. We have done an incredible amount in just twelve days. Bali is just what is needed, the perfect place to relax and recharge our batteries. Found you by accident! 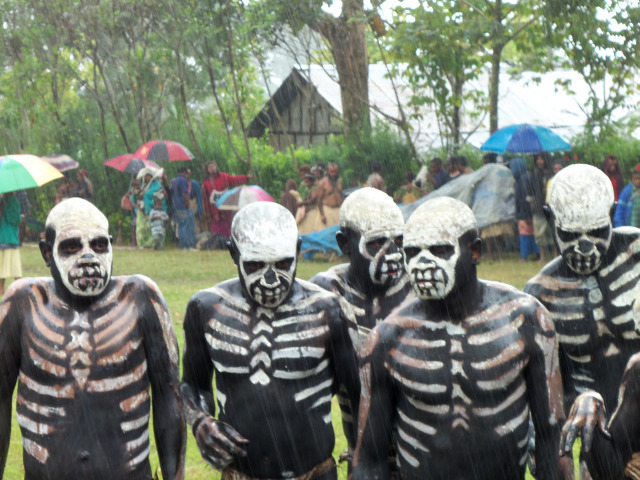 We’re going to PNG next May and to the Tumbuna sing. I loved the honesty of your exploits. All sounds amazing except for your flight in the clouds!!! I guess i’ll be packing lots of Bonine! And there are some of us “almost oldies” who have decided NEVER to fit the “image”…. Happy travels… I will be signing up for your blog. Hope to cross hiking trails or 5 star hotels with you one day.